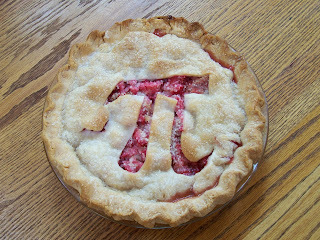 For the mathematically inclined and other varieties of nerds, dorks and geeks, happy Pi day! It's a year old, but I realized I never posted the surprise that Amber gave me last Pi day. So here it is for all to enjoy... the Pi pie. It was rhubarb, and ultra delicious, as always. If we can get the gumption up, this year is looking like a nice apple + blackberry. Who says math isn't tasty?